Analyst Katy Huberty in a note to investors obtained by Business Insider is lowering fiscal 2017 iPhone revenue estimates by 3 percent due to "weak demand ahead of the 'supercycle.'" An iPhone "supercycle," as it is referenced by Wall Street analysts, is the theoretical upwelling of demand after a year of revenue declines. Some blame the lack of interest on three years of minor improvements to what has become a staid smartphone lineup. While iPhone 7 is expected to stabilize the downturn in iPhone growth, the effects of last year's slump are ongoing. 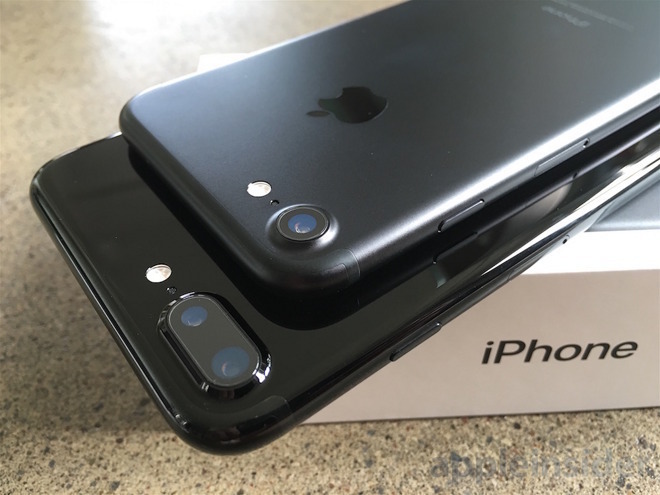 Apple last January guided for, and subsequently realized, its first ever year-over-year iPhone sales contraction in the second fiscal quarter of 2016. Shipments were equally dismal in the following two quarters, culminating in three straight quarters of revenue declines for the company. As for the coming "supercycle," Huberty and other analysts expect suppressed iPhone demand to explode as buyers who passed on iPhone 6s and iPhone 7 join regular upgraders in picking up this year's handset. Morgan Stanley predicts iPhone to post sales growth of 20 percent in 2018, a huge comeback from the preceding nine months. Helping drive demand this year is Apple's rumored "iPhone 8," a handset featuring next-generation technology like an OLED display, wireless charging, full-face screen with invisible Touch ID home button and more. Recent rumblings out of Apple's East Asian supply chain suggest the device will ditch aluminum for forged stainless steel as part of a "glass sandwich" design reminiscent to the iPhone 4 series. Due to technological hurdles and supply limitations, OLED panels being one of the most constrained, Apple is said to launch limited numbers of a completely redesigned iPhone model alongside the usual "s" cycle upgrades. Whether the high-end variant can be produced in quantities large enough to push the iPhone shipments needle is unknown. Investors should get a better view of Apple's upcoming year when the company reports fiscal earnings for the first quarter of 2017 on Jan. 31. AppleInsider will be covering the ensuing investors conference call live starting at 2 p.m. Pacific, 5 p.m. Eastern.